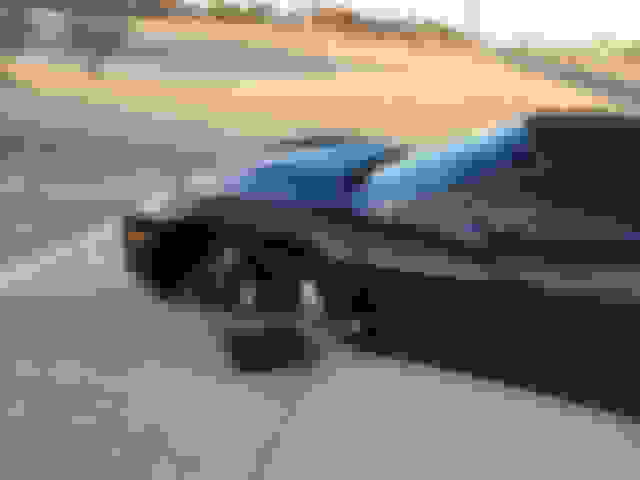 I bought this 2005 Conv last wed and the dealership and didn't finish the 120 point check. I took it home they said they will do a oil change , new brake and detail next week. I took the Vette in yesterday and they did all that. I left the dealership an almost got on the freeway, but took the side streets home. Went 6 blocks the front end started shimmy real bad at 45mph I hit the brakes and BLAM. 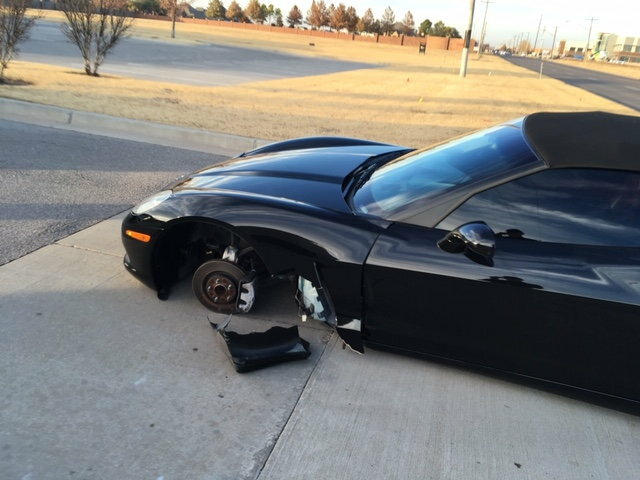 The left front tire came off the Vette flying down the street almost hitting a on coming car, vette slide across both lanes stopping in a driveway. I crawled out of the Vette on my hand and knees. I was stunned no one got hurt. A woman behind me saw the whole thing. I have her number, I called the dealership and they came and flatbed the Vette back to the dealership. I found just one lug nut in the street and my McGard tire lock was missing too. I bet someone gets fired over this. Either lug nuts were not tight or stripped. Wonder how much this will cost the dealership? Sorry this is so long, I didn't sleep good last night and my whole body is sore from being tense up. That's my tire in the middle of the pic in the grass. Inside of mag was scored with deep cuts. Rotor is just as bad. Do you thing the front end is messed up?? Thanks guys. Wow sorry to hear that as long as you are ok. You can maybe try and get your money back as it not only requires body work but mechanical work. Hopefully the frame is ok. I would not want the car. You could have gotten killed or injured others as well. If they give you a hard time consult an attorney ! Good luck! Last edited by enventr; 11-30-2018 at 05:43 AM. I can tell you, I worked at a dealership, and it's not the first time we had that occurred and repaired the car, the tech we made pay for his mistake. While the car is in for repair, here is you owners manual to learn your car. Very scary....and frustrating. Not only is this an awful thing to happen and very luckily no one was hurt, but it is also an indication of negligence on the part of the dealership. You may want to talk to someone about having them replace this with a brand new car. You may want to talk to someone about having them replace this with a brand new car. That's horrible! Just thank God you wernt doing 70 on the freeway when it happened. Glad nobody was hurt! I hope the dealer steps up and you don't need to get an attorney involved! Scary, but I think unless the dealership decides to own it, it would be hard to prove anything. It's a used car, and they're not really liable for it. They could easily claim the aftermarket lugs or something like that are to blame, and the lugs nut being found doesnt amount to evidence, they could have flown off anywhere. Good luck, and remember that you want the dealer on your side for this. According to the OP, they did brake work, in order to do so they had to remove and reinstall the wheels/lug nuts, so they are liable. OP: WOW, glad now one was hurt. He said they just did a brake job so pretty easy to put the blame on them. I do agree he needs them on his side if possible. Will make the repair much smoother. Glad no one was hurt. Good luck. I don't agree with this at all. He drove straight from the dealership and wheel flies off. Pretty difficult to think they are not responsible. Last edited by FAUEE; 11-30-2018 at 10:50 AM. Not a good way to be introduced to your new car! He bought the car from a dealership. Took the car in for work which should have been done first. Wheel falls off after they had removed wheels. Under what scenario would the dealer not be responsible? That is scary and fortunate that no one got hurt. Keep us updated on the response from the dealer.